Arts and crafts Victorian double bed. A truly magnificent and classic piece of English solid oak furniture. This stunning golden oak arts and crafts double bed is an extremely rare model, and in beautiful condition for its age; circa 1900. 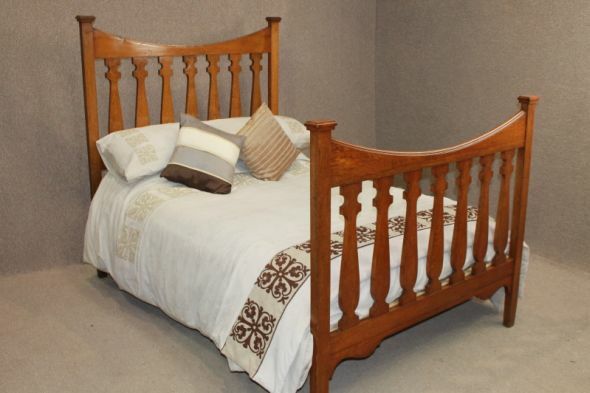 It comes complete with a newly made pine bed base, and is finished a lovely golden oak colour. It has the odd small mark but this does not detract from the appearance of this bed, and would complement any arts and crafts bedroom set. The bed breaks down into individual pieces for ease of transportation and reassembly.